Editing is turning the pot. 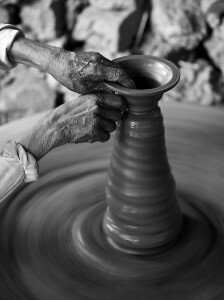 I find writing a first draft of a novel like digging the clay from the ground with my fingernails. Sometimes I hit a rich seam, other days I’m scraping at scraps and wondering if there’s any clay left to find. But it all builds up eventually and you end up with enough – more than enough – words for a novel. But they are so not in the right order. And the pile of words looks nothing like a story. Editing is turning a pot. It feels much closer to creating the vision I have in my head. In fact, when I was editing The Night Rainbow two years ago I wrote this. The third draft will look much better though. The nuances start to shine through. Still you keep going. With every spin of the wheel you find another imperfection, and as you correct it you notice that it now shows up other flaws. Will this thing ever be perfect? Will it ever be good enough? Eventually there will come a time to say yes. But I’m not there yet with this book. I’m only just finishing the second draft and looking forward to the first round of polishing. And the next…and the next. Publishing editor’s line edits, Copyedits and Proofs. And not forgetting the book covers! Photo above via Flickr Creative commons. For (c) see here. The final edits are the most satisfying of all. That’s sometimes when you can relax with what you already have and then you can add a few more interesting phrases. Let the real writing begin! Exactly. I *really* enjoyed picking over the little details with my editors. And when you’re at that stage you can forget what it took to get there because it’s hard to imagine a world where that story doesn’t exist. The image of the wheel and the pot is perfect. As someone right in the throes of an edit it fitted how I have been feeling over the last few days. the inital struggle followed by moulding and caressing to create the story I want. The initial struggle is just right! And I’ve heard that the more times you do it the easier it gets (crosses fingers)! Good luck with your edits! Great post, Claire! This is exactly how I see first drafts and editing too. I love the editing stages… the first draft, not so much – probably because I want it to be perfect already! But you have to go through the whole process, and it’s always worth it in the end.